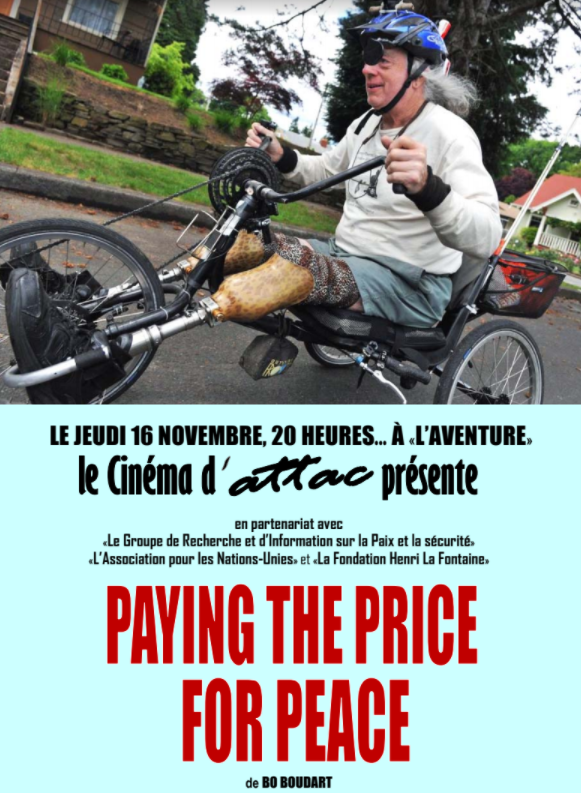 Paying the Price for Peace Premiers in Europe! Called the Cinema D’ATTAC festival, this is an annual festival of films about peace & security issues in Belgium. to 1970 during the Vietnam War. From the rice fields of Indochina, he returned &quot;galvanized&quot; -and pledges to forever denounce the belligerent policies of the United States. a field activist, an effective proselyte &quot;for peace&quot;, works as an educator, participates in long hunger strikes, carries out acts of civil disobedience, and invites citizens to refuse to pay taxes to the federal government. Willson and other Veterans for Peace lie on the rails in Concord Station Weapons Station (California). But the train they intend to block does not stop and runs over them. Willson loses both legs up to the knees, and also suffers a severe fracture of the skull, with loss of the right frontal lobe. But he miraculously, he survives after surgery. Later, this former Vietnam war protester with exemplary courage will find out that he was placed by the FBI on a list of suspects accused of “domestic terrorism” at the request of President Reagan, and that the conductors of the train had received, that day, the order not to stop the train. a documentary of incredible strength.